VISION FM series are AGM Technology and are designed for general-purpose applications, such as UPS, telecom, and electrical utilities. With 10 years design life, the batteries comply to the most popular international standards, such as IEC896-2, BS6290-4, Eurobat Guide. With more than 15 years of production experience, VISION FM series of VRLA batteries are recognized as the most reliable and high quality battery system in the industry. Engine starting, Communication equipment, Fire & security systems, Uninterruptible power supplies, Telecommunication systems, Electronic cash registers, Electronic test equipment, processor based office machines, Control equipment, Electric powered bicycle and wheelchairs, Geophysical equipment, Marine equipment, Medical equipment, Portable cine & video lights, Power tools Solar powered systems, Television& video recorders, Vending machines, Other standby or primary power supplies . Throughout the whole manufacturing process, PPM and ISO 9001 are carried out to make sure that the product reliability and defect ratio meet with the PPM standard. The extra strong construction ABS container reduces case bulging and plate warping, ensuring long life and high performance. Perfect venting system, which operates under low pressure, is designed to release excess gas and keep the internal pressure within the optimum range of safe and efficient performance. 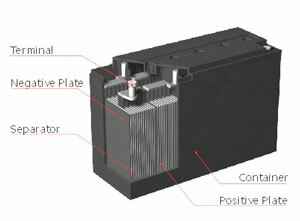 Unique technical processes are used into the grid alloy and electrolyte additives, so that the battery can be recharged easily to a normal level even after being over-discharged. The batteries live up to standards JIS, DIN, BS and IEC. An appropriate ratio between positive and negative active materials. Fiberglass separators manufactured from borosilicate, giving them excellent resistance to high temperatures and to sulphuric acid. The high level of porosity of these separators is used to retain the quantity of electrolyte necessary for cell operation, but without any free electrolyte. A pressure relief valve which allows gas to be released if necessary in the case of an accidental overcharge.